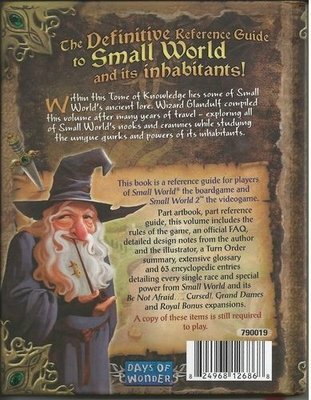 From the back cover: This book is a reference guide for players of Small World the boardgame and Small World 2 the videogame. 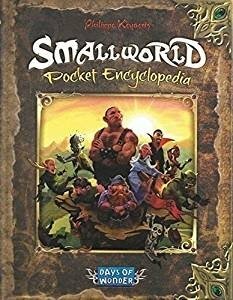 Part artbook, part reference guide, this volume includes the rules of the game, an official FAQ, detailed design notes from the author and the illustrator, extensive glossary and 63 encyclopedic entries detailing every single race and special power from Small World and it's Be Not Afraid..., Cursed!, Grand Dames and Royal Bonus expansions. A copy of these items is still required to play. Package Contents: Part artbook, part reference guide, this volume includes the rules of the game, an official FAQ, detailed design notes from the author and the illustrator, extensive glossary and 63 encyclopedic entries detailing every single race and special power from Small World and it's Be Not Afraid..., Cursed!, Grand Dames and Royal Bonus expansions.